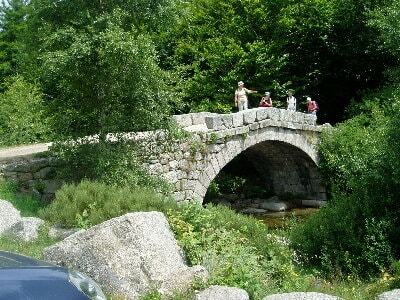 Over twelve days Stevenson walked 220 kilometres through the Auvergne and the Cevennes from Monastier sur Gazeille Haute Loire to St Jean-du-Gard via La Bastide-Puylaurent and Pont de Montvert in Lozere with the GR70. He had chosen as his thematic quest the trail of the Camisards. I was woken in my cave above the Tarnon by a man walking his dog who told me that it was Sunday. 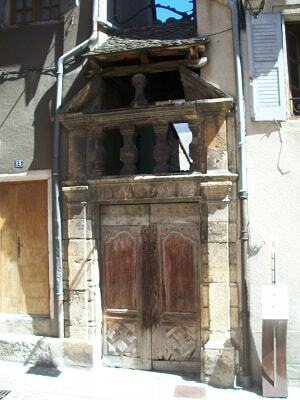 I rolled my sleeping-bag and ambled down the path towards Florac and a medley of bell-ringing, the peals for Catholic Mass begonning as those for the Protestant Eucharist were dying away. 'We had the wars,' shrugged the baker, as if the bitter struggle 300 years ago between the Protestant Camisards and their Catholic persecutors were yesterday. One of the leaders of the ragged Camisards - who had used Florac as a mountain lair was the guerrilla genius Jean Cavalier, a one-time shepherd boy who changed sides after being defeated by Louis XIV's generals and then, by a circuitous route, rose to lieutenant-governor of Jersey under the British before being buried in 1740, now a major-general, in the parish of St Luke's, Chelsea. On the last day of September, 138 years later, a twenty-seven-year- old lapsed Calvinist walked into Florac intent on picking up the echoes of the Camisards. He was told in the cafe of cousins and nephews descended from Cavalier and of bones dug up where ancestors had fought. Robert Louis Stevenson was launching his career as a writer by making a romantic journey with a recalcitrant donkey called Modestine. 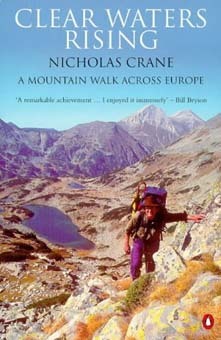 Over twelve days Stevenson walked 220 kilometres through the Cevennes from Monastier sur Gazeille to St Jean-du-Gard. He had chosen as his thematic quest the trail of the Camisards. It was a canny judgement; from Bloomsbury as Travels With a Donkey in the Cevennes to Bruno, where it appeared as Putovani s Oalici do Hor, Stevenson's well-crafted story became a best- seller, and launched a century of donkey abuse. I took a room in Chez Bruno on the place (still a pleasant 'alley of planes') and spent the rest of the day ambling around Florac's dishevelled streets. The 'live fountain' Stevenson had visited still tumbled in tiers past the twin-towered chateau (now a national park information centre) to a succession of weirs patrolled by ducks. Tilted berets and Citroens the colour of faded denim loitered outside the cafes on the place. The street where Stevenson lodged on his ninth night, Rue de Therond, now teetered between Gallic quaintness and irredeemable rubble, its derelict houses exfoliating plaster and shedding fractured drainpipes. The mist had not lifted by morning. Ahead of me lay the heart of Lozere, the poorest and most isolated of France's departements, and at fourteen inhabitants per square kilometre, the least populated (the figure for Paris is 21.537). To this impoverished land came a beast as horrible as the Cannibal of Gargas. Twenty years before Blaise Ferage terrorized the Pyrenean foothills, the Beast of Gevaudan was preying on this part of the Cevennes, eating sheep and young women. Bodies were found drained of blood and partially eaten. Theories blazed along the valleys: the Beast was a vampire wearing a wolfskin, or it was a wolfpack being guided by a crazed tyrant, or it was a lone wolf of enormous size. For three years the Beast caused panic in the isolated communities of the Cevennes, separated from one another by forest and appalling roads. The bishop of Mende ordered public prayers and hunts were dispatched by the intendant of Languedoc. As more went missing, dragoons rode out and a reward of 6000 livres was offered by the king. 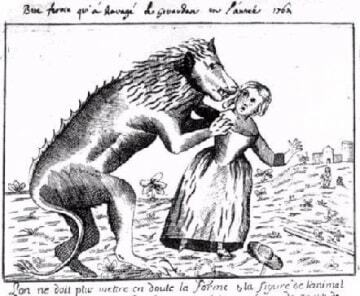 When a 130-pound wolf was shot in September 1765, the harassed population filled the churches and the Beast was sent, stuffed, to Versailles. Three months later two boys were killed near Mont Lozere. Through the winter and following spring the killing spree resumed with new ferocity until Jean Chastel found himself looking down his sights at a second wolf. After that, the killings stopped. A wilderness lives through its beasts, and the memory of grotesques such as the Cannibal of Gargas and the Beast of Gevaudan goes some way towards filling in gaps left by exterminated predators. Those that remained the wolves and the bears were with me nevertheless, a presence whose dark superiority brought a quality of scale to the mountains that was taller than the peaks, colder than the ice and deeper than the water. Above Florac my draille rose towards the bleak granite baguette of Mont Lozere, thirty kilometres long and five wide, but rising to 1699 metres. A ridge eased up the mountain, its spine occupied by a community of menhirs, some three metres high, frozen in the opaque mist. I stayed with the menhirs till darkness fell and the full moon cast long shadows from each standing stone. Near the uppermost menhir stood a small wood where I climbed to the top of one of the pines and howled at the moon while the tree swayed in the gale and the silver clouds sailed above Mont Lozere's petrified sentinels. I fell asleep at the foot of the tree on a bed of pine needles and woke before dawn to find water dripping on my bivouac bag and realized that I was screwed up with cold. This bald western rump of Mont Lozere, wrecked by overgrazing and shorn of timber, was being hammered by winds that hit no higher land between the Alps and the Atlantic. I pulled on my thin balaclava helmet beneath my trilby, and then the cotton hood of my coat. The wind was too strong for the umbrella. The little black copse was still marooned in thick mist and I had to use the compass to find the track down to the Bramon, a stream that had turned into a freezing turgid little river. I had to take off my boots, socks and trousers to wade across. As I completed this bleak exercise, rain began to fall and I reassured myself that the weather would definitely improve. In about April. Beyond the Bramon I came to the hamlet of La Fage where I rested and sheltered inside the communal bread oven, a small barn-like building which had been restored as a 'curiosity' in 1982. A plaque described the demise of La Fage: in 1861, the hamlet had had 146 inhabitants distributed between twenty-seven families; now there were twenty inhabit- ant and six families. With its walls of great blocks and rye roofs it must have borne a resemblance to the granite-and-thatch palloza villages of the Sierra de Ancares. Many of the houses had fallen down; six were now second homes and one was a gite d'etape. The bread oven had last been fired in 1950. Beyond the door of the oven stood the clocher des tormentes, a granite obelisk topped by a belfry hung with the bell which used to ring out the rhythms of La Fage: the Angelus, weddings and funerals. But it took its name from its task of guiding down men from the mountain on nights like the one I'd just spent, when mist and wind were on the rampage. The bell of La Fage has lost its tone. Children rang it one frosty winter's day and it had cracked in the cold. The draille climbed up from La Fage through dripping, leafless silver birch and then heather, from cairn to cairn until 1500 metres, when the gradient eased and I met the full force of the gale. For ten minutes I shel- tered in a crevice on a weathered tor - Mad Dog Rock - while I organized my equipment for the forthcoming battle. The Col de Finiels was about twelve kilometres along the ridge of Mont Lozere from my tor, in bad weather about three or four hours' walking. The track writhed from col to col through forest whose clearings were churned to quagmires by loggers' tractors. Wind and rain came in blasts which threatened to wreck Que Chova. From the waist down I was soaked to the skin; water squirted from the cuffs of my boots and mud reached to my knees. Checking the map, and setting a new compass bearing meant furling Que Chova while the wind tried to tear the map's plastic bag from my hand. Droplets streaming down my spectacles had to be wiped off before I could focus on the map's contours and measure distances to the next col. In this sightless state I reached the summit of Finiels late in the afternoon. A line of wooden posts led down to the col where I met the tall stone posts that had guided Stevenson up Mont Lozere from the north. He came up the warm, dry turf on a sunny morning wearing his knitted waistcoat, with his jacket tied to Modestine's pack. The posts had straddled Mont Lozere since medieval times, spaced every fifty paces to guide travellers down from the heights. I touched each one as I passed, wondering whether Modestine had loitered to scratch a rump on the rough granite. So many self-conscious Stevensonians have already poked about in this wood that I half expected to bump into knots of young men puffing meerschaums, with TWAD open on page 172 and clutching twitching divining rods. I found the dell, or at least I found a dell which would do. The young trees surrounding his camp-site were now statuesque Scots pine and in the calm of the evening I knew why Stevenson had spliced into his chapter the sequestered-bower quote from Paradise Lost. Dawn broke and I lay in my sleeping-bag postponing the moment when I would have to pull on my wet trousers. For the next two days I was buffeted by hailstones as I followed Stevenson's route north from Mont Lozere through milder country whose roofs now wore tiles not slates. But his footsteps became fainter and less interesting. And I grew bored with his company and that of a route whose charm had now been buried by bitumen. Hounded by a hail squall I arrived at La Bastide-Puylaurent at dusk. 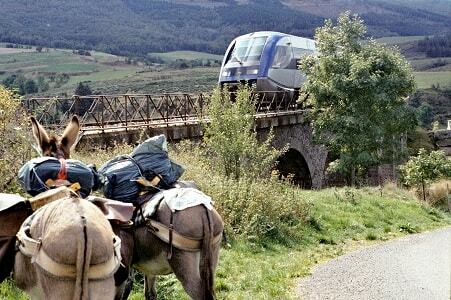 The village grew up around the railway junction linking Mende, Clermont-Ferrand and Marseilles (the Cevenol) and became popular between the wars as an accessible summer resort for those driven inland by the heat of the Mediterranean coast. In the winter they came to ski. 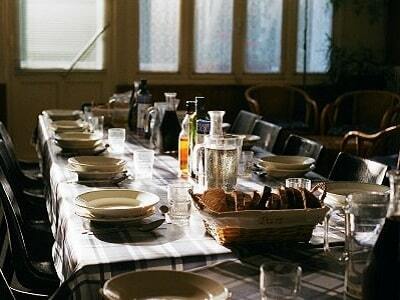 Hotel Ranc ('Pension de Famille: Alt. 1024 metres') was built in 1926. After the Second World War La Bastide-Puylaurent faded back into the forests. For a while the village subsisted on the custom of workers from the railway and from local dam-building projects. Hotel Ranc became a holiday home for old soldiers who had served in Algeria. Now it was a gite d'etape run by the young and immensely tall Philippe Papadimitriou Pausenberger Vanniesbecq, a Belgian-Greek whose grand-father once owned the Hotel de Paris in Cairo. After a series of occupations, from gold-panning in California to hod-carrying in Peru, Philippe had bought the Hotel Ranc, complete with its conteats, from the bed-spreads to the oak-and-chrome Frick refrigerators. 'It was intuition, not science !' Philippe laughed. 'Voila !' La Bastide-Puylaurent was dying. The winter population was down to 183. In summer it swelled to 2000, with the extra railway staff and the villa-owners from Marseilles, Ales, Nimes and Montpellier. Each year fewer residents stayed up for the winter. 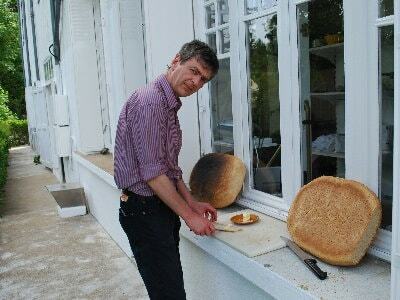 Philippe's girlfriend, Catou, remembered coming up to La Bastide Puylaurent as a girl to collect mushrooms, from her home in Ales, before all the pits closed.The branch line to Mende was losing money and, if that closed, La Bastide Puylaurent might disappear from the map. There was pessimism in the village; one of the other hotels had closed recently; marriages were disintegrating.